12:26 am - Panda Shop is now Open for Business!! Aside from what's listed and pictured I also have some mangas, doujinshi's and clothes I have added/will be adding to the store as I have way too much clutter in my room. 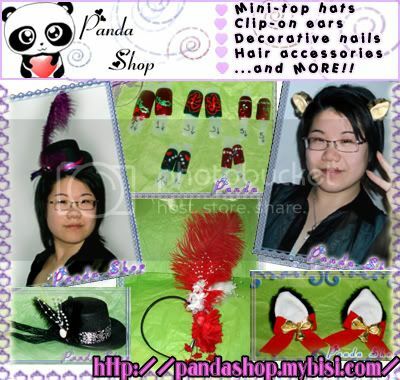 I checked out you panda shop & I have to say its pretty neat-o! Some great stuff there, but (lol) I'm not a girl...so no purchases for me! Great job with the site & I hope it is prosperous!